BMW is all set to launch the new-generation 5 Series on February 11, 2017, and the German carmaker has just revealed the 5 Series Touring ahead of its Geneva Motor Show debut. As expected, several features that debuted in the sedan are carried across to the estate. The 5 Series Touring comes with four different engine options which can be paired with the standard 8-speed Steptronic transmission. Its 2.0-litre 4-cylinder petrol engine produces 252PS and 350Nm of peak torque and will sprint from 0 to 100kmph in a claimed 6.5 seconds. The 3.0-litre 6-cylinder inline petrol engine generates 340PS and 450Nm of peak torque and can do 0 to 100kmph in a claimed 5.1 seconds. The diesel lineup gets 2.0-litre and 3.0-litre mills developing 190PS/400Nm of torque and 265PS/ 620Nm of torque respectively. The 2.0l can be mated to either a standard 6-speed manual gearbox or an optional 8-speed Steptronic transmission. The 2.0l oil burner completes the dash from 0 to 100kmph in a claimed 8.0 seconds (automatic: 7.8 seconds), whereas the 3.0l powers from 0 to 100kmph in a claimed 5.8 seconds. Like the rest of the new 5 Series line-up, the new BMW 5 Series Touring carries forward the 'driver-focused' cockpit with ample head, leg and shoulder room. The only difference is that the estate is slightly longer than its sedan sibling. Inside, the new BMW 5 Series Touring features a high-resolution 10.25-inch touchscreen display. BMW claims, with the latest-generation BMW Head-Up Display, the estate offers about 70 per cent larger projection surface. 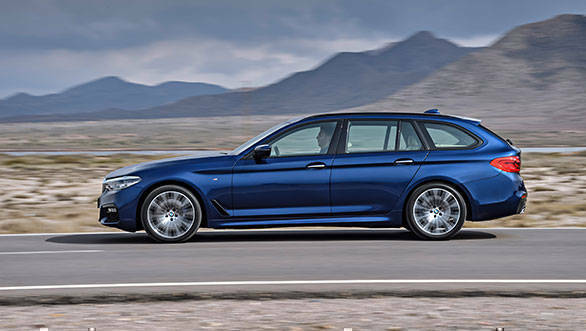 Again, like its sedan sibling, the 5 Series Touring is based on an all-new chassis which reduces the car's total weight. 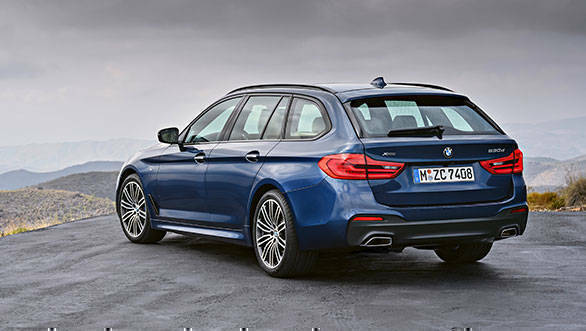 BMW claims that use of aluminium in suspension side members and tailgate alongside drive-system technology reduces the estate's fuel consumption and emissions by 11 per cent compared to its sedan siblings. Keeping automated driving in mind, BMW has also equipped the 5 Series Touring with new assistance systems and functionality like crossing traffic warning and priority warning, lane change assistant and lane keeping assistant with active side collision protection, and the evasion aid. The safety system can also help in steering and lane control assistance from walking speed up to 210kmph. 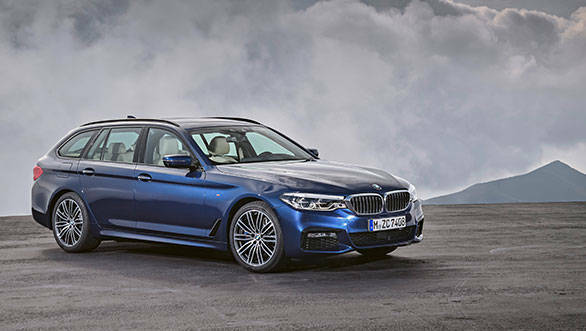 Though the BMW 5 Series is coming to India soon after its global launch, the 5 Series Touring may have an even further launch date as it was developed specifically for the European market.